Navelina and Newhall are the current industry standard early varieties. Both tend to produce elongated fruit which is not considered a issue for the local market but is not desirable for fruit being exported. Some plantings of the new variety M7 have also been made in recent years however inconsistant tree performance and sometimes smaller fruit size have impacted on its uptake by industry. Early season varieties may compete with citrus from the USA that is still in the market place. Available through Auscitrus and local nurseries. Originally from California, this variety matures around three to four weeks before Washington. Rind colour is achieved at a similar time to Washington and degreening is required. Fruit quality may be slightly inferior to Washington. This variety matures two to three weeks ahead of Washington, depending on location. In recent years it has been superseded by other varieties with improved fruit characteristics. The fruits have yellow/orange skin and are small to medium in size. They can be difficult to peel and may have high acidity early in the season. In some seasons, fruit splitting can be a significant problem. Available through Chislett Nurseries in Kenley, Victoria and selected local nurseries. M7 is an early colouring sport of Navelina found by Chislett Developments Pty Ltd in Victoria and is subject to PBR in Australia. It has the advantage of colouring earlier and holding its acid longer than standard Navelina which gives the variety a longer harvest window. It is rounder than Navelina making it more acceptable for export and has good sugar and acid levels. Trees have a tendency to overcrop in the early development years and careful crop management, including thinning, is required to prevent this. There has also been reported instances of inconsistent tree growth within plantings. As M7 is a limb sport of Navelina there is the possibility of incompatibility with Swingle Citrumelo rootstocks although this is unclear at the present time. Some plantings of this variety have been made in WA. Industry standard, available through Auscitrus and local nurseries. This originated in California and two strains are available in Australia. Navelina 7.5 was introduced from Spain and released from quarantine in 1988. Navelina 315 was imported from Italy and released in 1996. Navelina 315 is a low acid selection with a tendency to produce small fruit and is of minor importance in Australia. Trees are compact and suited to high density planting. The fruits mature three to four weeks before Washington, are medium size, have excellent colour and good eating qualities. They are inclined to be more oval-shaped than Washington and are known to be susceptible to albedo breakdown in some seasons. Navelina should not be grown on Swingle Citrumelo rootstock as incompatibility results in tree decline and death between 10 and 15 years after planting. There is also some work suggesting that there may be an incompatibility with C35 rootstock. Also from California, this variety has a distinctive oval shape but can vary, especially if trees are growing vigorously. Fruits are large with good colour and eating qualities, maturing about the same time as Navelina. The trees are medium in size and crop well. This variety is less susceptible to albedo breakdown than Navelina in eastern Australia. This small to medium-sized early variety matures around four weeks before Washington. The trees have a dwarfing growth habit and can be difficult to grow. This variety may suffer from early overcropping, resulting in large yields of small fruit. Pasin has not been grown extensively in WA. This variety is around 10 days earlier than Navelina at Dareton Research Station in NSW. It has low acid and is easier to peel than some. It is highly susceptible to albedo breakdown and gibberellic acid application is necessary if holding the fruit on the tree for an extended period. This variety has not been grown in great numbers in WA. Another Californian, this selection matures around two to three weeks before Washington. It is still widely grown in southern Australia, although being replaced with newer varieties. The fruit can be dry, with pale internal colour early in the season. Washington is still the main mid-season variety in WA. The red-fleshed Cara Cara is also widely accepted although it is grown in low volumes relative to Washington at the moment. Originating from a limb sport of Washington navel found in California, this variety was released in Australia in 1990. The fruit matures up to two weeks before Washington and is of similar shape, large, with orange skin and good eating qualities. The trees have a similar growth habit to Washington. This variety was discovered in Venezuela in 1976. It has deeply coloured flesh similar to Star Ruby grapefruit but a more pinkish-orange colour. In South Africa it matures slightly earlier than Washington. In local evaluation it has excellent pink-orange internal colour and similar size and maturity time to Washington. Some reversion of tree limbs that produce fruit with normal orange flesh colour has been observed and these need to be removed or reworked as soon as they are found. Limb sports producing variegated foliage are also known to occur on some trees, reinforcing the unstable nature of this mutation. These limbs should also be removed from the trees. 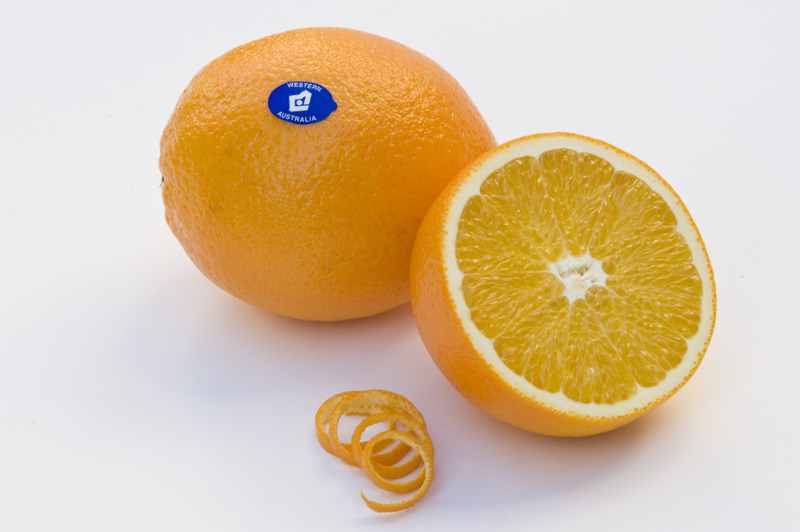 This is the original seedless navel from which all other selections have been derived. Originally called Bahia, it was imported into the USA from Brazil in 1870. Trees are of medium vigour and size. Fruits are round, with a distinctive well-developed navel. Fruit colour and eating qualities are good. Compared to other citrus, maturity is early with ripening beginning in mid-May to June, depending on location, and continuing until September. Available through Variety Access Pty Ltd. This variety was discovered in South Africa and is a mutation of the Plamer navel variety. It has pink/red flesh which is very similar to that of Cara Cara when grown under West Australian conditions. Fruit are similar to Cara Cara but have shown in eastern states trials to reach optimum maturity around two to three weeks later which may be partly due to rind quality being retained for a longer period on the tree. This maturity difference has been less obvious in WA trials. As with Cara Cara some reversion of limbs to produce fruit with normal orange flesh colour has been observed and these need to be removed as soon as they are found. Fruit grown in South Africa has been shown to develop a distinctive pink/red coloured button and stem however this has not been evident in fruit on trees trialed in Western Australian locations. No commercial plantings of this variety have been made in WA to date. While Lane Late is the most widely grown late navel, reports about its performance vary. Many new plantings are favouring some of the newer late selections listed below, particularly Chislett. Available through some local and interstate nurseries. A late navel selected in the 1950s from Mourquong, NSW. Eastern states evaluation shows this to have good fruit quality, although it is slightly more susceptible to albedo breakdown than other late navels. It has performed fairly well in WA although plantings are small. Available through Aussie Orange Nursery at Wentworth NSW. This selection from Ellerslie, NSW, has good flavour and fruit characteristics compared to Lane Late. It is reputed to be slow to commence cropping but long-term yields are comparable to Lane Late. Limited knowledge is available on performance in WA. Available through Chislett Nurseries, Kenley, Victoria and selected local nurseries. A late navel selected from a Washington planting in 1986. This variety is subject to PBR in Australia. Chislett has very good flavour and fruit qualities and is considered one of the best late navels. It is widely planted in the southern eastern states and is only surpassed by Lane Late in area planted. There have been significant recent plantings in WA. This variety originated as a bud sport on a property in Curlwaa, near Mildura, Victoria. Tree characteristics are very similar to Washington. The fruits are also similar in shape and size but tend to have a smoother rind and a smaller, less protruding navel. Lane Late is slower maturing than Washington, ripening about three weeks to a month later. Fruits tend to have a little less flavour than other late selections. This matures at about the same time as Washington but can be kept on the tree for about three weeks longer. Although it extends the season of Washington about three weeks, it is not comparable to Lane Late and other late selections which hang on the tree much longer. A selection from Curlwaa, NSW, reputed to have more flavour than Lane Late. This variety is planted in large numbers in the Sunraysia region. Limited knowledge is available on performance in WA. A late navel selection from Nangiloc in north-west Victoria in 1982, this has better fruit quality than Lane Late. Although generally round, in some seasons its shape is reported to be slightly elongated. Experience in the eastern states suggests that this variety will produce higher yields than Lane Late. There is still relatively little knowledge about its performance in WA. Available through Sunraysia nurseries in NSW. This mid to late season selection from Mourquong in NSW was selected in the 1950s, as was Autumn Gold. In eastern Australia it matures earlier than Lane Late and is reputed to have a high Brix level and sweet taste. Summer Gold has a low limonin content, making it more suitable for fresh juice production than other navels. This is not a vigorous variety and trees are small and compact. Interstate experience suggests it will not maintain fruit quality on the tree for as long as other late navel selections. Other late navel selections grown around Australia include Hutton, Wiffen and Wilson. In general, these mature around the same time as Lane Late but are able to be stored on the tree up to a month longer. Common oranges represent a wide and diverse group that are not pigmented and have a variety of growth habits and fruiting characteristics. Until recently the majority of these produced seeds to some degree and, because of this, they have declined in popularity for fresh consumption. This group contains most processing varieties. As most WA growers are targeting the fresh market, the trend in the past decade has been to replace common oranges with navels. This has meant that local common oranges are often in short supply through summer and there is renewed interest for the fresh market, especially for some of the low-seeded Valencia selections that are now available. Other low seeded Valencia selections have recently been introduced and evaluation of them has commenced. A selection of Valencia from South Africa that has few seeds and matures one to three weeks earlier than standard Valencia. Overseas information suggests that trees are more productive than Valencia and have slightly larger fruit. This has not been replicated at some Australian sites where size and yield have been an issue. This variety has had limited testing under WA conditions. An early maturing Valencia selection from South Africa that has excellent juice content, flavour and very few seeds. It holds on the tree for as long as standard Valencias but fruit quality can decline. Some significant plantings of this variety have been made in WA in recent years and performance to date has been good. This is an early season Valencia selection which has shown to be productive under West Australian conditions. It produces fruit with a distinctive ring around the stylar end. Fruit meet the Australian Standard from early to late August depending on the season and location grown. Fruit have some seeds with between one and four seeds per fruit being recorded in local testing. Although the seed count is higher than for Midknight fruit matures earlier and trees crop consistently. No commercial plantings of this variety have been made in WA to this point. Valencia is the most extensively grown orange variety in the world and is thought to have come from Portugal. Trees are productive, large and vigorous with an upright growth habit. Fruit are medium size, have thin rind, mature late and keep well on the tree. The lateness of maturity means that the skin may re-green. Valencias are most important for the juice market as the juice has excellent processing characteristics. Many selections available in Australia including Benyenda, Berri, Casey, Jenner, Keenan-3125, Keenan-3247 and Smith. Many other varieties are available but few are grown commercially because of established markets for navels and Valencia. Many are more suited to processing than fresh consumption. Some of the more common include Hamlin, Joppa Parson Brown, Pera (Olimpia), Pera (Limeira), Pineapple and Salustiana. Blood orange refers to common oranges that have red internal pigmentation. They are not common in WA although in recent years there has been renewed interest in this group. Blood oranges require a degree of chilling or cold weather to initiate the development of internal fruit colour (anthocyanin) and they are likely to be more suited to cooler areas where night temperatures are lower. Some old varieties include Arnold, Maltese and Ruby, while newer varieties include Tarocco Ippolito, Tarocco Meli and Tarocco Rosso. This variety has developed good internal pigmentation in Bindoon where night temperatures are colder than at coastal sites where colour development has been poor. Fruit have a tendency to be small and need to be left on the tree for a considerable period after colour development to allow suitable internal quality standards to be achieved, especially in colder areas. Matures September to October in Bindoon. This variety has performed the best of the three Tarocco orange types evaluated at trial sites in WA. Internal development of red pigmentation at the cooler Bindoon site has been good, while colour development at warmer coastal sites, although evident, is not as good. Trees are vigorous in the juvenile stage and can be quite thorny until trees get older. Internal maturity levels appear to develop earlier than for Arnold Blood but fruit will still benefit from being left on the tree to develop better internal sugar and acid levels. Fruit size has ranged from small to medium and fruits mature from August to October in Bindoon. Fruit have shown to be susceptible to albedo breakdown in some seasons. Tarocco Ippolito showing internal pigmentation of flesh in fruit from Bindoon harvested on the 24th September 2012. Currently there are a number of new varieties of oranges (selections of navels and Valencias) being evaluated in WA and around Australia. More information is required on their performance under local conditions before including information on them in this webpage. 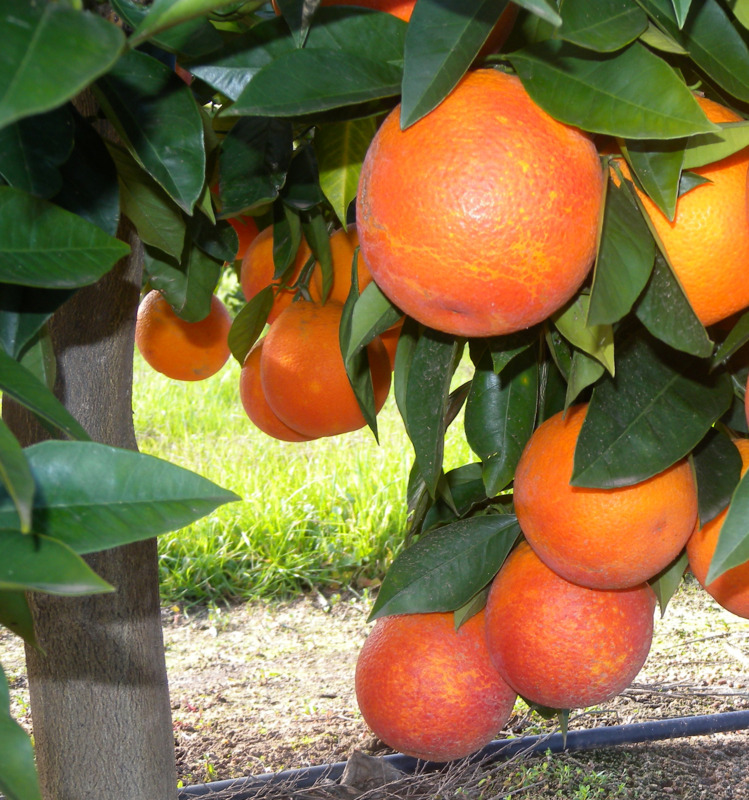 This webpage replaces Farmnote 540 Orange varieties for WA by Kevin Lacey.